When asked to give the first words you think of when someone says “financial advisor,” you may say retirement, investments or planning. As a client of a financial advisor, this is what you feel you are getting when you sit down to meet with an advisor. What may surprise you is how much more an advisor actually has to offer. Financial advising is more than just selecting investments. Anyone can buy a stock, mutual fund, or ETF today. Just fire up your smartphone, download an app, transfer some money and you are a few clicks away from your first purchase. Was that purchase a good decision, bad decision or just something that you wanted to buy? Now you own the investment, what happens next? Do you sell, and if so, when do you sell, how does selling an investment affect the other investments in your portfolio, what happens when there is a management change at the company or headline news? Only time and management of this investment will tell what the future effects will be. This is the type of expertise an advisor provides. It is the advice and service behind these investments that the advisor is hired for. A financial advisor is akin to a dietician or a personal trainer. You know how beneficial it can be to eat right and exercise. Everyone has a basic understanding of how to live a healthy life. So why do so many individuals seek out a dietician or a personal trainer? To help motivate and be our cheerleader, to direct us to the healthy life that fits our personal needs the best, and hold us accountable so we can accomplish our healthy-living goals. A true financial advisor will do the same thing with your financial health. They will examine your current circumstances and decide which options are best for your goals so you can make progress. Think about the last time you had a meeting with your financial advisor. Did they jump right into talking about performance metrics or the overall value of your portfolio? Most likely, if you have a good financial advisor, they asked how you are doing as a person, finding out the life events that may be affecting your life and ensuring that the life plan that has been or is being established is still the best course for you and your financial future. All of this interaction is to ensure your financial path still matches your investment allocation. You see, a financial life just doesn’t encompass your investments but is a holistic view of what your goals and objectives are and an action plan put in place to help you and your advisor stay on track through the years and milestones in your life. 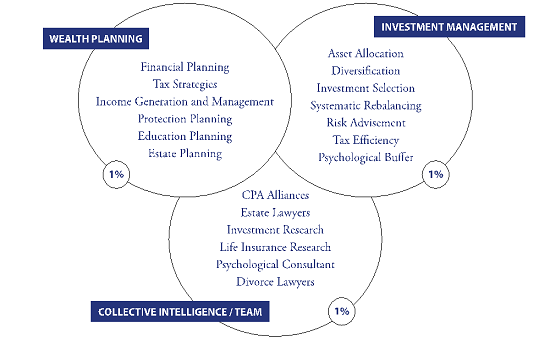 Financial advising is more than just investment planning and a slew of numbers. It is the careful consideration of all aspects of your financial health to guide you on a path to help you reach the goals you desire. A quality financial advisor will help you manage any and all decisions, guide you through the ups and downs of the market and help you plan for your future. If you are not receiving this level of service from your financial advisor, maybe it is time to reconsider who you are working with. If you don’t have this level of service from a fiduciary advisor who puts your best interest before their own, get a second opinion. It can’t hurt and it could bring you closer to the financially healthy path necessary to accomplish your vision for the future. Do you need to hire a financial advisor? Maybe and maybe not. Let's first make it clear that everyone needs a financial plan and needs to be able to implement that financial plan. Whether or not you need a financial advisor can be determined by the following three questions: (1) Do you have the knowledge necessary to make the right investment and planning decisions? (2) Do you have the time necessary to do the research and recordkeeping for the investments? (3) Do you have the desire to do the research, recordkeeping, and tax reporting for the investments and planning? If you don’t want to be your own financial advisor, don’t have the knowledge to do it or simply would rather spend your time on something else more enjoyable, find a fiduciary advisor to help you navigate the path so you have a better chance of attaining your financial goals and achieving the financial success you desire in life.